Enjoy the benefits of private air travel with a charter flight to Toledo, the capital of the Castilla-La Mancha overlooking the surrounding plains from its hilltop location. Whether you’re booking a private flight to check out the medieval Arab, Jewish and Christian monuments, or for a business meeting in the Castilla-La Mancha region, our team has access to thousands of Wyvern-certified private aircraft and can book the ideal aircraft for your trip. Jet Charter Europe believes in providing private flyers with a one-on-one consultative service experience that exceeds every expectation. Your time, privacy, flight preferences and most of all, safety, are our top priorities, and our private air charter representatives are available for you by phone and email 24 hours a day, 7 days a week. When using our service, you can expect quick response times and an easy, hassle-free booking process. Request a quote or call us today and arrange your private charter flight to Toledo, Spain. 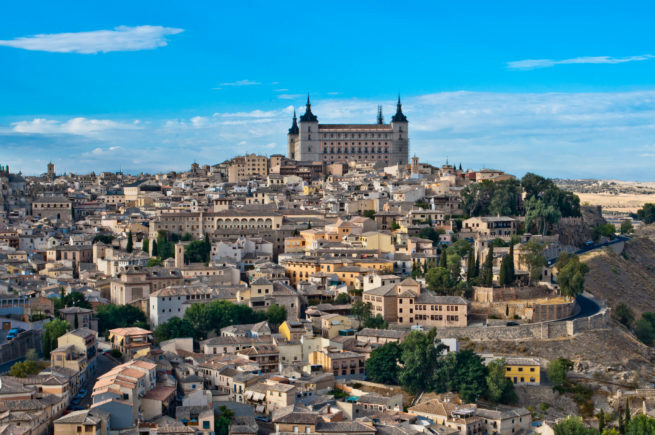 Toledo, capital city of the province sharing its name, is centered on a hill overlooking the plains of Castilla-La Mancha in central Spain, just southwest of Madrid. The place known as the “City of Three Cultures” has a lot to offer private luxury jet travelers, from its splendid multi-cultural architecture, quality wines and splendid cuisine, to a variety of hotels and resorts for luxury getaways, business trips and special events. The following list of our top choices was created based on factors such as Jet Charter Europe passenger feedback, location, amenities and online reviews. Once you arrive in Spain via luxury private jet, our Toledo Jet Charter service brokers can also arrange ground transportation to/from the hotel of your choice. The city of Toledo is known as the “City of Three Cultures”, where Muslim, Christian and Jewish communities historically coexisted for centuries. Once capital of Castile, it is also referred to as the “Imperial City”, having served as the main venue of Charles V. Toledo would go on to become the historic capital of Catholic Spain after Catholicism was made law in 1492, and its Cathedral is one of the most extravagant cathedrals in the country. Today, private jet charter explorers will find a city full of history, tradition and art, renowned for its medieval Arab, Jewish and Christian monuments within its walled old city, along with many churches, mosques and synagogues. Food and wine are main characteristics of Toledo, a producer of cheese, olive oil, marzipan and saffron. La Mancha is the homeland of Don Quixote, the hopeless knight created by Spanish writer Cervantes, and is more recently home to emerging wine vineyards starting to produce high quality wines over bulk quantity. Check out more of our recommendations for luxury private jet travelers while staying in Toledo, Spain. Jet Charter Europe utilizes the following airport to fly clients privately to/from Toledo, Spain and neighboring areas. Request a Quote or give us a call at 1-888-987-5387 to speak with one of our Toledo Private Jet Charter service brokers for your next luxury vacation, business trip, or special event.